Most people who love golf also love the outdoors. Private putting greens are a wonderful source of home entertainment. 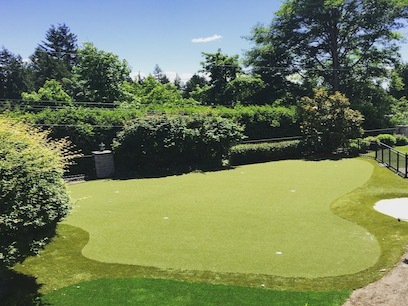 The difference between most boxed putting greens and our, SYNLawn® professionally installed backyard putting greens is professional engineering. 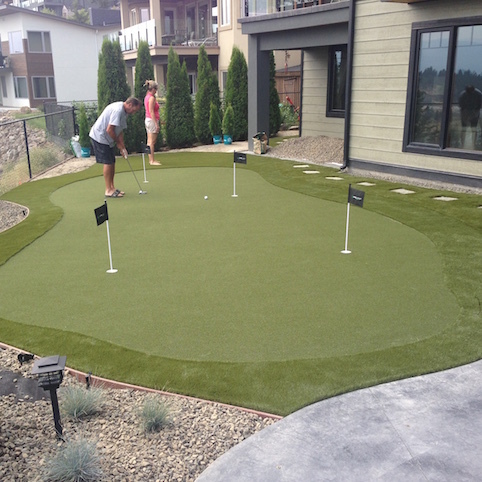 Together, SYNLawn® and Dave Pelz offer golfers of all ages and experience a putting green that challenges true golf performance. Dave researched, measured and studied golf performance characteristics from PGA courses and golf resorts world-wide. From the data he collected he developed Elements of Practice (EOPs) so people, just like you can practice at home fine-tuning your skills. Every putting green we install is customized with Mr. Pelz’s EOPs so you can choose what area of this fine game you prefer to improve upon. We understand the benefit of practicing on a green that behaves like a natural golf green, not just a putting green that looks good. As Dave says: “43% of golf is putting and 65% of golf takes place within 100 yards of the green.” Wouldn’t you rather be practicing like a pro? What you choose to buy can make all the difference! Learning the basic skills and gaining confidence can begin at home so when you are on the professional golf courses you feel more comfortable. 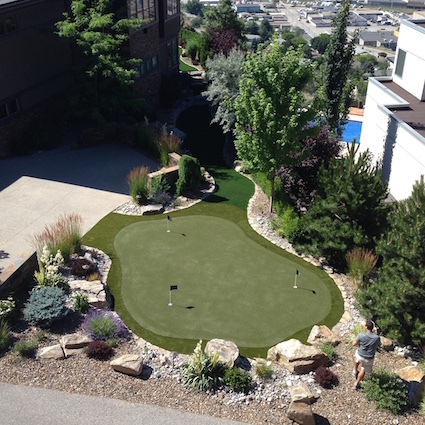 Visualize a beautiful golf course in your front or back yard with a variety of green grass textures sculpted perfectly in a custom designed landscape. No watering necessary, no Saturday mornings spent mowing the grass and more time to golf. SYNLawn® also installs driving range tee-lines, driving mats and chipping mats that allow for complete swings without grabbing the club head. Transform your landscape into a landscape that is easy to maintain, fun and improves your golf game. Teach your children the basic skills required for the game. Invite friends over and create your own tournament. 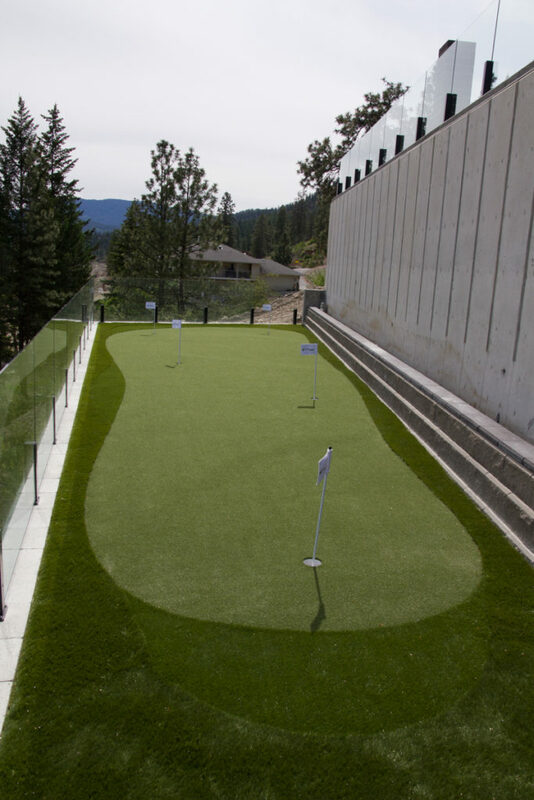 Even a smaller space where lawn seems impractical you can install a backyard putting green that provides hours of entertainment. 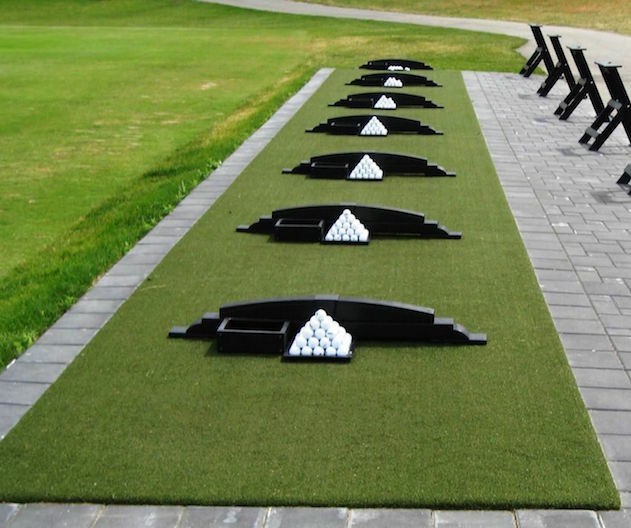 Call to speak with one of our professionally trained golf master installers who will guide you through the process of creating the best personal putting green to improve your golf skills today. For the lower mainland call: 778-246-2210 or 1-866-758-7888.